MORBID MESSIAH is a Death Metal band formed in 2015 by Anubis Sandoval after she moved to Guadalajara from Cancun, Mexico. 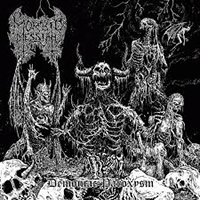 Today we are checking out the bands debut full length coming out October 22nd titled Demoniac Paroxysm. My first Impressions harken back to the beginnings of death metal in bands like SADISTIC INTENT. You have the signature buzzsaw death metal tone in the guitars with vocals like gargling gravel punctuated with blast beats. Death Metal seems to be splitting into two directions these days between experimentation and purists that choose to honor the past with some grey area in between. MORBID MESSIAH would definitely be more for the purists than those who prefer change. I would fall into the category of someone who likes a band that really pushes boundaries, so this isn’t my cup of tea per say, but that doesn't mean I can’t appreciate or recognize it’s merit! Let’s dive in.. The opener “Rise of the Rottenness” starts off with horror movie sampled screaming, then lumbering riffs foreshadowing the carnage to come. This, being the albums intro, gives way to the albums second track. We are then blasted with the second track “Charred Devastation” which is a no holds barred blast of frantic drumming and smoky distorted riffs. It gives the beginning of the album a nice dynamic as the first two tracks are opposites in attitude and tempo. “Breath of The Ominous” opens with a badass sample and has a nice groove and some really groovy double bass in the middle of the song that probably make it my most favorite song on this LP. I can really only do so much of the same pattern of blast beats and appreciate some variety in the rhythm here. Overall Demoniac Paroxysm is either going to be something you love or don’t. I know some people that will be head over heels for this new release, and I’m genuinely glad you dig it. It may not be for me, but i’m glad I spent my time with it to expand my horizons. I often find myself liking something overtime I didn’t before. Only time will tell. Overall: Even if I didn’t love this album, the band has certainly found their niche. MORBID MESSIAH definitely knows what they are doing and they have the formula down to a T. Good jams for some late night grave-robbing activities.